Joey Abarta has spent the last ten years touring North America, Europe, and Asia, teaching and performing music on the uilleann pipes. A Los Angeles native, he first received instruction on the pipes from Dubliner Pat D’Arcy, a founding member of the Southern California Uilleann Pipers Club. 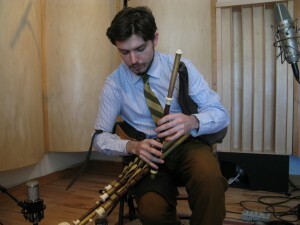 His musical skills have been further honed by several visits to Ireland, a year-long stint working in Japan, and continuing relationships with master pipers. In August of 2009, Joey’s accomplished playing won him an All-Ireland championship, placing second worldwide at the Fleadh Cheoil na hEireann. This year Joey became the first American uilleann piper to win first prize at the An tOireachtas. Currently based in Boston, Joey divides his attention between performance, teaching, and recording. In addition to performing solo, he tours with Mick Moloney and the group The GreenFields of America; while at home, he organizes the meetings of the Boston Pipers Club, teaches for Comhaltas’ Boston Music School, and organizes various traditional music concerts and events. Joey will cover the foundations of piping with thoughts on grace notes and their combinations, basic piping ornamentation, tone and clean finger shapes, and piping repertoire.